Paperback Book: Build your own Farmhouse by Sally Walton. Includes a base for putting the completed buildings on. This book is new - as in we haven’t cut anything out of it yet. She has been dancing ever since, and after a spell as a principal dancer in New York, now dances for the Dutch National Ballet in Amsterdam. A story of courage and inspiration. An easy-to-read book told in a matter-of-fact style. HORRIBLE HISTORIES - VILE VICTORIANS. Discover all the foul facts about the Vile Victorians - all the gore and more! FROM A SERIES OF 'HORRIBLE HISTORIES ' READING BOOKS BY TERRY DEARY. The books are ideal for independent readers and are divided into sections, with a 'Contents' page at the beginning. Ladybird book Series 651 - First published 1965 - 60p net. "Animals And How They Live". A fascinating book for young ones, lovely illustrations, best for 8 to 12 years. Cover marks, inside 2 small scribbles, mostly very good -clean, bright, colourful. DISCOVERING DINOSAURS - WEIRD & WONDERFUL EDUCATIONAL BOOK. WHICH DINOSAURS HAD SPIKES?. HOW DID HORN-FACED DINOSAURS LIVE?. WHY DID THEY LOOK SO STRANGE?. FIND OUT ABOUT THE VERY FIRST DINOSAURS, THEIR CHARACTERISTICS AND WHO THEIR ANCESTORS WERE IN THIS ILLUSTRATED GUIDE. Ladybird book Series 633 - First published 19 78 - 30p net. " 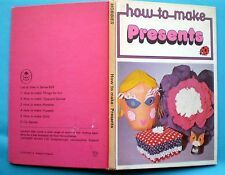 How To Make Presents ". Ladybird book - Series 536 - First published 1965 - 2'6 net. "Butterflies, Moths And Other Insects". A lovely book, truly gorgeous illustrations, will be loved by 8 and over. Ladybird book Series 662 - First published 19 66 - 2'6 / 12 1/2 p net. Ladybird book Series 621 - First published 1963 - 2'6net. "Air, Wind And Flight ". All very good - stiff,clean, colourful, bright. Mog was tired. She was dead tiredMog thought, I want to sleep for ever. And so she did. The kitten is frightened of everything noise, newspapers, bags and being picked up. Mog thinks the kitten is very stupid.But then Mog realises that the nervous kitten doesnt know how to play and just needs a little bit of help. Vintage Gloss Cover Ladybird Book. 536 Nature series. In very good second hand used condition. Sea and Estuary Birds. See pictures for details. Any questions please ask. Vintage Matt Ladybird Book. 662 series. In good second hand used condition. The Story of Music. See pictures for details. Any questions please ask. Ladybird Book. Inside. This book is in a very good condition just a small finger mark. Older books are prone to foxing discolouration of pages. FROM A SERIES OF 'HORRIBLE HISTORIES ' READING BOOKS BY TERRY DEARY. The books are ideal for independent readers and are divided into sections, with a 'Contents' page at the beginning. CHILDREN'S READING BOOK. And the simplicity of the process ensures that they can finish a project in just one afternoon. Kids can mix and match designs, colours, and projects to create art that's uniquely their own. 22 bright, varied projects, from organizers to clothing to bookmarks and beyond. T. rex slap watch. A super silicone design Tyrannosaurus rex slap watch with. When do footballers poo?. Can you play football on Mars?. What is a magic sponge?. What is a vomitory?. When do footballers wee?. Where do goalkeepers let in chickens?. Where Football Rules the World, Where Football Saves the World, Where Football Tackles the World (Hardcover), Football School The Amazing Quiz Book. Large hard back book with dust cover. Explores ways of experiencing the world through art with chapters including: Looking and Seeing, What's Art for?. Lots of colour images, a great read and teaching aid. Ladybird book Series 727 - First published 1979 - 40p net. "Understanding The Sea". Discover the sea in this fascinating book, wonderful illustrations, best for 8 to 14. Read once - Excellent condition. Ladybird book - Series 651 - First published 1974 - 24p net. "Prehistoric Animals And Fossils". A lovely book, gorgeous illustrations, great for children around 8-14. Ladybird Book. Series 633. Matt Cover. How To Make Presents. Older books are prone to foxing discolouration of pages. 40p on back cover. Ladybird book Series 536 - First published 1967 - 15 p net. All very good - stiff,clean, colourful, bright. "Your Body". A fascinating book, with really clear, gorgeous illustrations, best for 10 and up. LADYBIRD BOOK 'NAAMAN AND THE LITTLE MAID' SERIES 522 no price First Edition ? COVER HAS MARKS AND EDGE WEAR MORE AT CORNERS--. COVER IN GOOD CONDITION--. This book is to be used in conjunction with Storyworld cards. NO CARDS, BOOK ONLY. Discover more ideas about how to use your Storyworld cards. Hardback book with very minor reading wear. I will help all I can with all claims. "Nature's Roundabout". Ladybird book Series 727 - First published 1979. 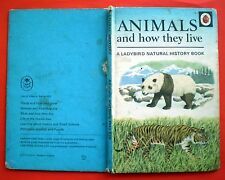 A fascinating and fun book on the balance of nature, best for 8-14 years collectors. Book hasn't been used, no marks or writing to any of the pages, looks unread. THE LAST ONE. THIS IS ONE OF THE SERIES 663. 2 LISTED ON THE BACK. INSIDE IN GOOD CONDITION. Bats and birds that look like faces. Skulls that pop up on anything white. Three donkeys with three ears between them. And walls that disappear. Relax, they’re only optical illusions. A fascinating, visually arresting title, which will keep the kids quiet for hours. Ladybird book Series 691 - First published 1969 - 15p net. "African Mammals". A fascinating book & classic in the series - beautiful illustrations by John Leigh-Pemberton, best for 8 plus & collectors. Ladybird book - Series 612 - First published 1964 - 40p net. "Book Of Prayers Through The Year". An enchanting book on prayers about nature, gorgeous illustrations, best for 5 to 11 years. All very good - stiff, clean, colourful, bright. "A Ladybird Book About Dogs". Ladybird book - Series 682 - First published 1968 - 2'6 / 12 1/2 p net. A lovely book on various breeds through the ages, gorgeous illustrations, great for animal lovers & curious children, best for 8 and over. Vintage Matt Cover Ladybird Book. The Seashore and Seashore Life. In acceptable second hand used condition. See photos for more details. Any questions please ask. A Retro Ladybird Book Series 606D: People at Work, The Builder. - Wear around board edges. - Pen to back board. - Wear and fading to spine cover. A Retro Ladybird Book Gloss / Matt. - Grubby back board. - Flyleaf removed. - Wear to boards. Ladybird book Series 601 - First published 19 62 - 2'6 net. "The Story Of The Motor Car ". It is AD 1096 and you are a dashing young Christian knight about to travel thousands of miles to fight for your faith and defend the Holy Land. Informative captions, a complete glossary and an index make this title the ideal introduction to the conventions of non-fiction texts for young readers. UNIQUE COLLECTION INTRESTING BOOKS X 6. I WONDER WHY ?. (3) Ronaldo. Titles Included in this collection Deal FORMAT : PaperBack. ((Series) Worst Case Scenario. (Dust jacket) N/A. size) 20 x 15 x 1 cm. weight) 260g. (Illustrator) N/A. (Format) Paperback.